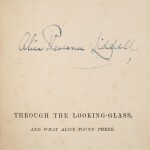 If your pockets are deep enough, you can bid for a fascinating artifact of literary history – the very copy of Through the Looking Glass once owned by Alice Liddell, who inspired Lewis Carroll to write Alice’s Adventures in Wonderland. Alice is said to be an especially hot property these days because there’s a new Syfy Network show debuting soon and a Tim Burton film coming out early next year. Beatrix Potter’s personal copy of The Tale of Peter Rabbit also will be available in the same Profiles in History auction on December 16. But never mind Alice and Peter when there’s Jack! I foresee taking out another mortgage on the Glyer ancestral lands so Diana can bid up that copy of The Lion, The Witch and the Wardrobe with the tipped-in C. S. Lewis autographed letter. 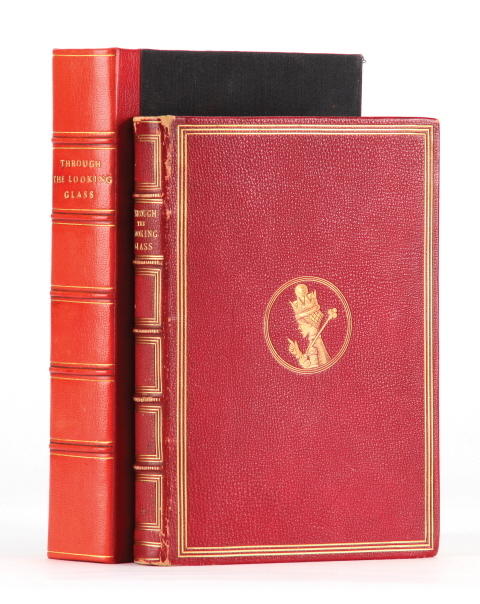 Two of the most important books in childrens literature to hit the auction block!!! 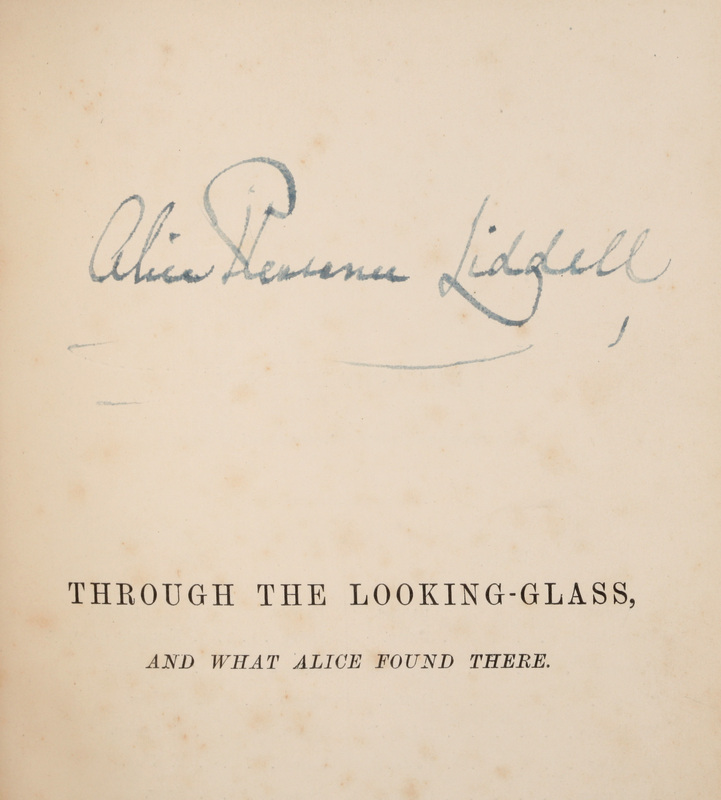 Calabasas, CA, November 23, 2009 – The “real” Alice’s* copy of Through the Looking Glass, and What Alice Found There ($100,000-$150,000) and Beatrix Potter’s own copy of The Tale of Peter Rabbit, specially bound with a personal inscription ($80,000-$120,000) will highlight Profiles in History’s December 16, 2009 auction of the Pat McInally Collection of Children’s Literature. This unique auction of 101 lots will also include a First Edition, first state of the text copy of The Wonderful Wizard of Oz ($40,000-$60,000), a First Edition of Goldfinger, inscribed by Ian Fleming to William Plomer, the book’s dedicatee ($60,000-$80,000) and a First Edition, First Issue Presentation copy of Through the Looking-Glass, and What Alice Found There, accompanied by something extra-two fine original pencil drawings by of Alice and Humpty Dumpty by illustrator John Tenniel ($40,000-$60,000). If there is a fan of classic children’s literature on your holiday shopping list, you will not find a better gift. Other volumes to be offered include Limited Edition copies of Winnie the Pooh, The House at Pooh Corner and Now We Are Six, all inscribed by author A.A. Milne and illustrator Ernest H. Shepard ($20,000-$50,000 EACH), a First Edition, presentation copy of The Time Machine: An Invention, inscribed by author H.G. Wells, ($20,000-$30,000), a fine First Edition (in dust jacket) copy of Stuart Little, inscribed by author E.B. White ($10,000-$15,000), a First Edition of J.R.R. Tolkien’s, The Fellowship of the Ring, ($10,000-$12,000), a First American Edition of Peter and Wendy, inscribed by J.M. Barrie ($6,000-$8,000), a copy of The Lion, The Witch and the Wardrobe, with a fantastic tipped-in autograph letter about Narnia by C. S. Lewis ($8,000-$12,000) a First Edition copy of The Story of Little Black Sambo ($8,000-$12,000) and a First Edition of Mother Goose in Prose, L. Frank Baum’s first published book for children and the first book appearance of Dorothy of Oz ($8,000-$12,000). In addition to aforementioned Goldfinger, James Bond aficianados will be competing for inscribed, First Edition copies of For Your Eyes Only ($20,000-$30,000), Thunderball ($15,000-$18,000) and On Her Majesty’s Secret Service ($8,000-$12,000) and fans of Harry Potter will find a set of Deluxe Editions copies of the first four Harry Potter books, all inscribed by J. K. Rowling ($6,000-$8,000) as well as other rare editions from the Potter series. 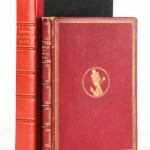 Besides the books themselves, collectors will find exquisite, original artwork from the books, including an original John Tenniel drawing of the Gryphon from Lewis Carroll’s 1865 Alice’s Adventures in Wonderland ($60,000-$80,000) and Beatrix Potter’s original preparatory drawing of Robin for The Tale of Peter Rabbit ($6,000-$8,000). Photo credit is Profiles in History. Additional art is available upon request. For more information about Profiles in History and to download a complete catalog of items available for this and past auctions, please visit HYPERLINK “http://www.profilesinhistory.com/” \o “http://www.profilesinhistory.com/”www.profilesinhistory.com. Pat McInally has been collecting children’s and young adult literature for over twenty years. He has gone to extraordinary lengths to acquire only the finest copies available, and is determined to only have the most important titles by each author, only in census condition, title by title. Pat himself is as unique as his collection of literature. A former punter and wide receiver for the National Football League’s Cincinnati Bengals from 1976 to 1985, Pat is the first Harvard graduate ever to play in a Pro bowl and a Super Bowl. He is also the only NFL player to achieve a perfect score on the Wonderlic Personnel Test. In 1986, Pat conceived the Starting Lineup series of action figures, which became a top seller for Kenner. McInally currently sits on the board of Wonderlic, Inc. as well as the National Football League’s Youth Football Fund and also finds time to coach high school football. Founded in 1985 by Joseph Maddalena, Profiles in History is the nation’s leading dealer in guaranteed-authentic original historical autographs, letters, documents, vintage signed photographs and manuscripts. Profiles in History has held some of the most prestigious and successful auctions of Hollywood memorabilia. Their auctions include costumes, props and set pieces from both vintage and contemporary film, television, and rock ‘n roll. Profiles in History’s location in Calabasas Hills, CA- virtually a stone’s throw away from every major Hollywood studio – ensures a constant flow of fantastic and rare collectibles. With an extensive network of dealers, collectors, and institutions, they are proud to play an important role in the preservation of motion picture history. Prior Profiles in History Hollywood auctions highlights include the “Cowardly Lion” costume from The Wizard of Oz ($805,000); a full-scale model T-800 Endoskeleton from Terminator 2: Judgment Day ($488,750); a King Kong six-sheet movie poster ($345,000); the Command Chair from the “U.S.S. Enterprise” ($304,750); the original “Robot” from Lost in Space ($264,500); Luke Skywalker’s lightsaber ($240,000), the Black Beauty car from The Green Hornet ($192,000); George Reeves’ Superman costume from The Adventures of Superman ($126,500); the H.R. Giger designed Alien creature suit from Alien ($126,500); a full-scale T-Rex head from Jurassic Park ($126,500), the Leaping Alien Warrior figure from Aliens ($126,500), Christopher Reeve’s ‘Superman’ costume from Superman: The Movie ($115,000), C-3PO’s helmet ($120,000), The Wizard of Oz ‘Winkie’ Guard Costume ($115,000); a “Ming the Merciless” cape from Flash Gordon ($115,000) and the Hydraulic screen-used Velociraptor from The Lost World: Jurassic Park II. ($115,000). This entry was posted in Like Show Business and tagged Beatrix Potter, C.S. Lewis, Lewis Carroll, Narnia, Profiles in History by Mike Glyer. Bookmark the permalink.